In the System.IO namespace (bound in with the @Import Namespace instruction) there is a class called Directory. This represents functionalities that can be used with directories and this class also contains the static (callable without object instance) method GetLogicalDrives. This method gives us an array of strings containing the drive letters. Of course I didn’t leave it at a simple listing of the drives obtained through GetLogicalDrives – I added a link to a further page which gives information about the contents of the root directory of the drive. Reading the directories works with the GetDirectories method, which returns an array of DirectoryInfo objects to me, with which I can then build the desired functionality (e.g. like here for another link for the Drill-Down). The same applies to the GetFiles method, which returns an array of FileInfo objects. More on this in the next section. For what, please, do I need exception handling? Well, it might be that I try to access something which I am not allowed to access and then I get one across my knuckles (this case might also be well known from Real Life…). Seriously: for example, the NTFS permissions for the current user might not be sufficient (listing forbidden). Now we are at file level. Of course, a file has many properties and the following example showfile.aspx presents just a subset of them. A glance at the documentation reveals the remainder of what I have left out to shorten the script. At the end of the script I undertook a quick detour to file reading to demonstrate how simple it is. First I open a StreamReader object, create a buffer, fill the buffer with the ReadBlock method and pass the HTML-encoded block over to the client. And presto, a tiny ‘File Preview’!. Nothing earth shattering, but it already shows how simple working with the contents of files is. As usual I have made life easier for myself and just use blank spaces for generating the tree. To make that visible in HTML, we have to use a <PRE> Tag – otherwise the blanks will be gobbled up. The function itself has two parameters: a DirectoryInfo object, and an integer variable which denotes the current level. 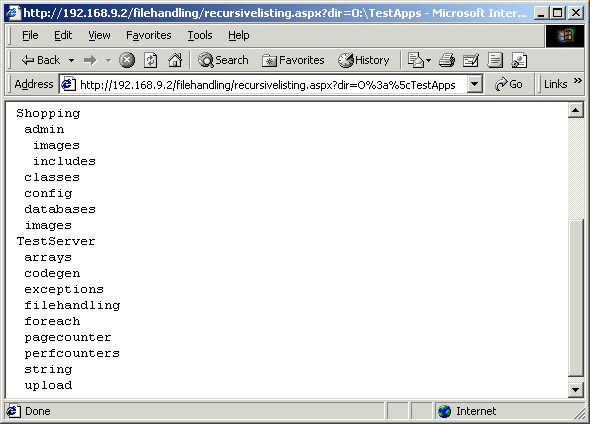 For the current level, the subdirectories are read (with GetDirectories) and then displayed in a for loop. For each DirectoryInfo object the function RecursiveDump is called, and level is increased by one.